On 16 & 17 June we had our third ITEC Examinations of this Academic Year. 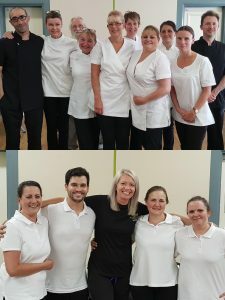 Congratulations to all ITEC Diploma in Reflexology and ITEC Diploma in Sports Massage students who passed the ITEC Practical Examinations. We will let you know once the Theory results are in! For these exams we had an experienced International ITEC Examiner who had not been to the Institute before. Most of the ITEC Examiners who have been to the Institute before know the standard of our students. It was interesting to note that the Examiner stated in his ITEC Examiners report – “the students were well prepared and standards high“. The examiner went on to say the Institute “team work well together and provide a high standard of teaching and learning which is evident from results. All assignments are of a high standard also“. 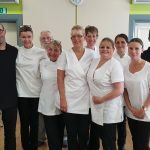 We are very proud of the treatments our Reflexology and Sports Massage students gave on the 16th! Well done. Talking of results you should have all received your Diplomas from your ITEC Exams in April and May. In the last three Academic Years (September 2014 – August 2017) we had over 200 students achieve over 90% in an ITEC Examination (90% is the boundary for a Distinction) with 19 of those students achieving 100% in an ITEC Examination. In the first two ITEC Examinations of this year we have already had 25 students achieve over 90% and 1 student achieve 100 % in their Examinations so far ! 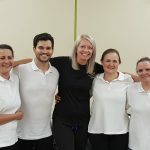 A Special Congratulations to Ieva Apeikyte-Kiourtsidou for also achieving 100% in her ITEC Diploma Sports Massage Theory Examination – an excellent result! This entry was posted in Massage Courses London. Bookmark the permalink.